Adapted from The Brain’s Way of Healing by Norman Doidge, MD, 2015, pages 168-176. 1. The mind programs the functioning of the brain. We are born prepared to learn. We can adapt our brains and movement to particular surroundings. Even when we damage our brains, usually plenty of brain remains to take on damaged functions. 2. A brain cannot think without motor function. Just thinking of a movement triggers that movement, changes tone in that part of our body. Using our brains triggers four components: motor movement, thought, sensation, and feeling. 3. Awareness of moving is the key to improving movement. 4. Differentiation—making the smallest possible sensory distinction between one movement and another—builds brain maps. 5. Differentiation is easiest to make when the stimulus is smallest. The less effort we use, the more we can notice. If you’re lifting a piano, you won’t notice if a fly lands on it; if you’re lifting a feather, you will. 6. Slowness of movement is the key to awareness, and awareness is the key to learning. If you leap too quickly, you can’t look before you leap. 7. Reduce effort whenever possible. If you are straining, you aren’t learning: if strain, no gain. No pain is gain. 8. Errors are essential, and there is no right way to move, only better ways. If you don’t make mistakes, you won’t learn. No one speaks her native language perfectly from day one. 9. Random movements provide variation that leads to developmental breakthroughs. Sometimes it’s useful to wander! 10. Even the smallest movement in one part of the body involves the entire body. When you’ve got a ball of yarn, whichever part of the yarn you take hold of, the whole ball comes along eventually. 11. Many movement problems, and the pain that goes with them, are caused by learned habit, not by abnormal structure. Often there’s nothing to “fix.” Improvement can come from changing your movement patterns. Norman Doidge, M.D., is a psychiatrist, psychoanalyst, researcher, author, essayist and poet. He is on faculty at the University of Toronto’s Department of Psychiatry, and Research Faculty at Columbia University’s Center for Psychoanalytic Training and Research, in New York. He is the author of two New York Times bestselling books on neuroplasticity. Learn more about Dr. Doidge on his website. 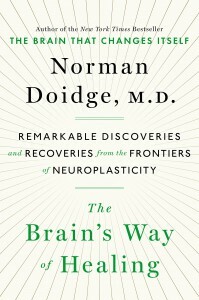 This entry was posted in Neuroscience, Somatic education, Theory and tagged healing, Norman Doidge on May 1, 2015 by DallasFeldenkrais. Excellent overview! Talk about talking points. Thanks for providing a really useful outline for all who want to understand the brain, or the Feldenkrais Method, better.